The Yoga Direct Thai Yoga Massage Mat is an ultra thick, futon-style yoga mat, perfect for meditation, restorative yoga, or yin yoga. Featuring a removable, machine-washable cotton cover and stuffed with organic cotton batting, this versatile yoga mat doubles as a bed for camping trips or sleep-overs! This mat is self-sufficient, with built-in storage ties and a carrying strap. Width is perfect. Length is perfect. Cover is great. My only beef is that the cotton inside gets super lumpy and it's very difficult to get it pushed out inside to where it's all even. Other than that, no quarrels. This is substantial and comfortable for a long yoga restorative class. It kept me warm and snuggly with added blankets, and I didn't have any drafts lying on the bare floor for an hour. Several asked where I got it. It is rather heavy and bulky to carry to class, however, but I wouldn't want to be without it. I plan on getting a rolling cart to carry it in next time. The cotton feels nice and has removable cover for washing, and a strap for carrying. I wish it were not so heavy and bulky but other than that, I love it. The color is true to the picture, bright and vibrant. 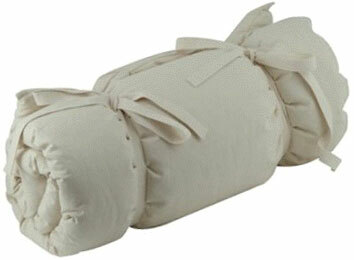 It allows for a deep relaxation in comfort, and could double as a sleeping bag.